While the mop-and-bucket mentality still prevails in many custodial departments, more facilities are investing in small, compact microscrubbers to improve efficiency and elevate the level of cleanliness. Ranging in size from 13 to 17 inches, these compact floor machines often serve dual functions, such as sweeping and scrubbing, thereby reducing the need for multiple tools. Keith Schneringer, director of channel marketing and sustainability for Waxie Sanitary Supply, San Diego, is seeing an increase in the use of microscrubbers in place of conventional mopping. According to distributors, using a mop and bucket for daily maintenance is “old school.” They also explain that improper mopping can be counterproductive and prone to human shortcomings. There is also a common misperception that a wet floor is a clean floor. But, in fact, this just pushes dirt around and can leave floors dirtier than they were before they were cleaned. 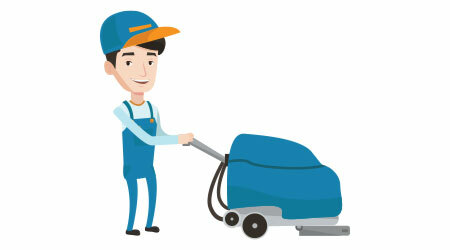 By contrast, a floor machine’s mechanical scrubbing action reaches upward of 150 rpm, providing a more thorough cleaning.